Having never heard of XPO Logistics (XPO), this proclamation from Jefferies (JEF) certainly caught our attention. It is very rare for an analyst to step out on a limb and make such a announcement. Whether realistic or not analysts very rarely provide price targets meaningfully above or below the current price. In all fairness, Jefferies was a joint manager on a recent secondary in March that raised $137M. Maybe their report should just be written off considering the connection. Founded in 1989, XPO Logistics, Inc. is a non-asset based, third-party logistics provider of freight transportation services that uses a network of relationships with ground, sea and air carriers to find the best transportation solutions for its customers. The company offers its services through three distinct business units: expedited transportation (Express-1, Inc.); freight forwarding (Concert Group Logistics, Inc.); and freight brokerage. XPO Logistics serves more than 4,000 retail, commercial, manufacturing and industrial customers through seven U.S. operations centers and 23 agent locations. 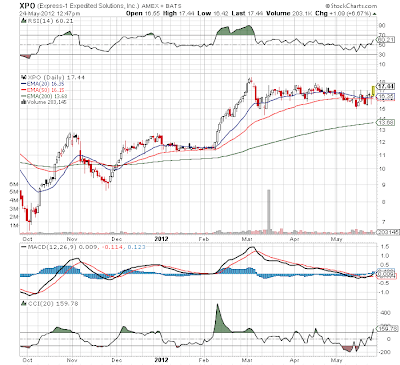 What is fueling this call is that XPO is on an aggressiv growth plan that could increase the revenue base to over $2B from the recent $44M quarter in just a few short years. Is this realistic and will it even create value remains the big question? Not being a logistics expert or even having random knowledge of the industry makes this call tough to follow. 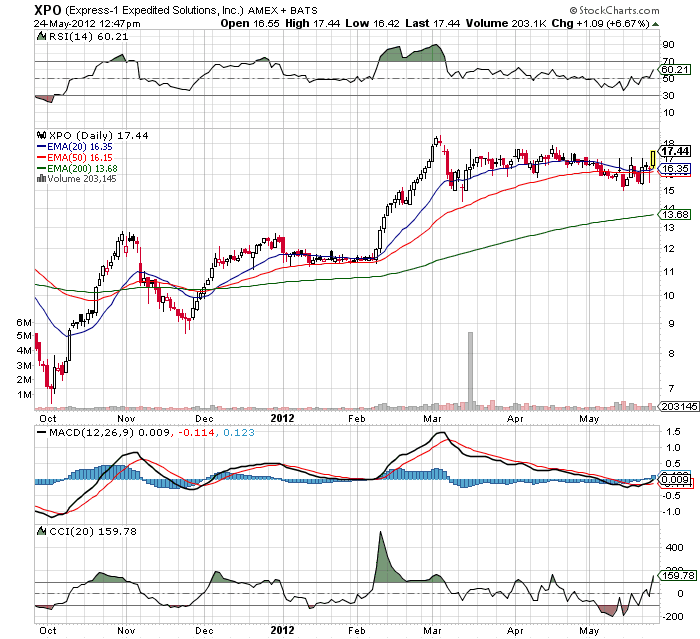 In the Q112 earnings report, the CEO proclaimed that he expected XPO to exit the year at a $500M runrate. That is a very aggressive growth rate from the expected revenue of $289M for the whole year. Analysts expect $750M for 2013. The company plans numerous acquisitions to achieve that target so clearly execution risk is very high. This strategy can really work in very fragmented industries. Whether or not this company will be successful might be worth keeping an eye out to track performance. The interesting part is plans to scale up the recent acquisition of Continental Freight Services in South Carolina. If the company can take a sleepy old business and add capacity and upgraded systems and turn a $20M operation into a $50M one, then maybe this business plan has some teeth. For now though, we'll just be watching from a save distance. The stock has already had a major run since the October lows. Today's action shows a potential breakout if it can follow through to new highs.